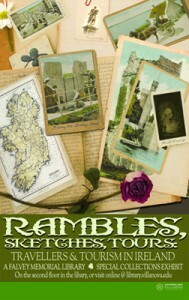 I am pleased to announce the debut of our new online exhibit, “Rambles, Sketches, Tours: Travellers & Tourism in Ireland.” The exhibit can also be seen in person on the second floor of Falvey Memorial Library through the end of the semester. The display was featured on the main library news blog last week. Promotional poster by Joanne Quinn. “Rambles, Sketches, Tours” highlights Irish travel narratives and related materials, primarily from the Joseph McGarrity Collection. The site is broken into sections that highlight the methods of travel to and within Ireland, the motives of some of the most influential and popular writers, and the development of the tourism industry. In addition, there are five sections that look at some of the most popular travel destinations. 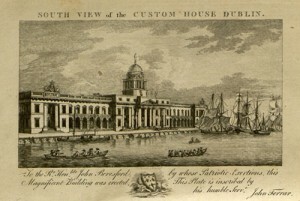 Ancient and Modern Dublin… (1796) by John Ferrar. Many of the works included in the exhibit are available in full-text versions online, either at our own Digital Library or at the Internet Archive. Links have been provided throughout the exhibit pages and on the exhibit bibliography, which also includes the materials I used in researching Irish travel and tourism. I had a lot of fun researching this exhibit and selecting items to include—I hope you’ll find some enjoyment, too. I’ll be posting a few behind-the-scenes tidbits over the next couple months, so stay tuned!